Welcome to Dubrovnik, commonly known as “the pearl of the Adriatic Sea”. You will be met at the airport and transferred to our exclusively-chartered boutique yacht, where a warm welcome awaits you from your Captain and crew. Dubrovnik’s old town’s charm lies on its white limestone streets, baroque buildings and ancient city walls that protected a civilized, sophisticated republic for centuries. A UNESCO World Heritage site, is on the menu today. After the tour, cruise to Slano, and reach the peninsula's wine empire, Ston is a jewel in Adriatic Coast. You will have an included tour of Ston followed by a wine tasting session. The Island of Korcula is one of the greenest islands in the Adriatic Sea. Like most of the Croatian islands, the Greeks, who gave it the name Korkyra Melaina or 'Black Corfu' for its dark and densely wooded appearance, first settled Korcula. Today you will have a guided tour of the town, passing by the its typical medieval architecture, including towers and cluster of red-roofed houses. Marco Polo the famous world-traveller and writer, as well as a Venetian merchant, is reputed to have been born in Korcula. Pucišca, a settlement in the middle part of the northern part of the island Brac. The town is known for having a special variety of stones, of which have been used to build part of the “White House” in Washington. For many generations, locals have been making use the stone and as part of your EmeraldPLUS, you will have a change to visit a stonemason-school. Founded in 1909 the school provides educational support for local students, producing quality religious icons, fountains, statues. Split is the second largest city in Croatia and the largest city on the Adriatic coast. The city has some fantastic sights with both Roman and modern architecture. Enjoy a guided walking tour through the many facades of this beautiful city. After the tour you will cruise to Hvar for a walking tour passing by the town’s cosy harbour, terracotta-roofed villas, Gothic palaces and 13th-century ramparts rising towards an impressive citadel. Your day begins with a guided tour of one of the oldest towns on the Adriatic Cost, Šibenik. This charming town boasts fantastic sights which exist from Venetian times. In particular the marble Cathedral of St. James, a UNESCO World Heritage list. The rest of the day is free to enjoy this beautiful town. Named after the Krka River, the Krka National Park covers an area of just over 142 square km and includes two thirds of the river itself. The top attraction of the Park are its magnificent waterfalls, including the famous Skradinski Buk falls which are one of Croatia’s most famous sights. Later, cruise to Trogir, a town designated as a UNESCO World Heritage site in 1997. Trogir is home to a number of fascinating historic sights and rich architecture. After breakfast, disembark your ship and transfer by coach to the town of Opatija, where you will have free time to explore. Included is a three-night stay in Opatija. Start your day with a tour of Rovinj. The town famous cobbled streets lead to the hilltop church of St. Euphemia. After the tour, visit a winery and enjoy a taste of the local produced specialties. Later, visit Pula, a seafront city on the tip of Croatia’s Istrian Peninsula. Pula is known for its protected harbour, beach-lined coast and Roman ruins. Settled in the prehistoric era and valued for its strategic location, Pula has been occupied, destroyed and rebuilt numerous times. Today is a day at your leisure, and your Tour Director is on hand to help plan your day’s exploring. Continue your journey, you will cross into Slovenia, where you will visit the Karst Caves in Postojna. A mini-train will take you underground through a fantastic web of tunnels, passages, galleries and halls. Then, it is a short drive to Lake Bled, an earthly paradise at the foot of the Julian Alps. Included is a two-night stay in Bled. Today, enjoy a boat ride to the island on the Lake Bled. The rest of the day is at leisure to continue exploring. Return to Croatia and venture towards the country’s capital, Zagreb. Your included guided tour will take you the main landmarks such as the Archbishop’s Palace, Opera House and Cathedral of St. Mark’s. Included is a two-night stay in Zagreb. Enjoy a leisurely day in Zagreb to continue exploring this lively capital. This morning cross borders with Hungary and arrive in Budapest. Embark your Emerald Waterways luxury river cruise ship. This evening, join your fellow travellers for a night–time cruise along the Danube, passing under the city’s numerous bridges. Today you will embark on an incredible journey to the archaeological excavation site Lepinski Vir. Located on the right bank of the Danube in the Djerdap gorge (The Iron gates of the Danube) near the town of Donji Milanovac, Lepenski Vir was the centre of one of the most complex prehistoric cultures. Rich cultural layers reveal traces of a highly developed culture that had complex social relations and as such was the first discovered urban settlement in Europe. Return to the ship and sail towards the narrow gorge between the European Alps and Carpathian Mountains, known as the Iron Gates. Arrive in Vidin, the most western town in Bulgaria. Your day will begin with an included tour visiting a local vineyard with wine tasting. Later, visit the medieval Baba Vida Fortress. Alternatively, embark on an EmeraldACTIVE hike to Belogradchik rock fortress. Tonight, join your Captain for a farewell reception and dinner. Today your ship will cruise to Rousse and visit the impressive cliff top town of Veliko Tarnovo, the former capital of the Bulgarian empire known once as the 'city of the Tsars'. Visit the historic town of Arbanasi perched on a high plateau overlooking the Yantra River and lined with traditional houses. The town is known for its 17th and 18th century churches and many examples of Bulgarian National Revival architecture. 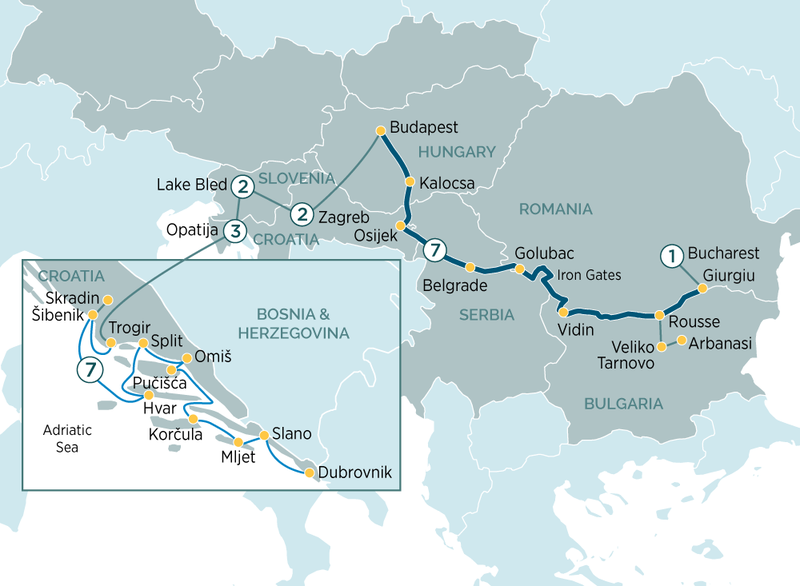 As the final stretch of the Danube weaves its way through the depths of eastern Europe, meet locals for lunch in their home, enjoy tours of Osijek & Belgrade & marvel at the beauty of the Iron Gate. This 11-day itinerary transports you from the heritage of Budapest to the backwaters of eastern Europe, where cities once shrouded in secrecy, now offer up a treasure trove of customs and traditions.